Has anyone been catching the Christmas in July movies on Hallmark Channel? I’m not sure where the saying “Christmas in July” came from originally, but there’s a delightful cool and crisp feeling that comes watching snowfall in July…Of course if you’re in the Southern Hemisphere, the world might feel a tad chilly anyway. 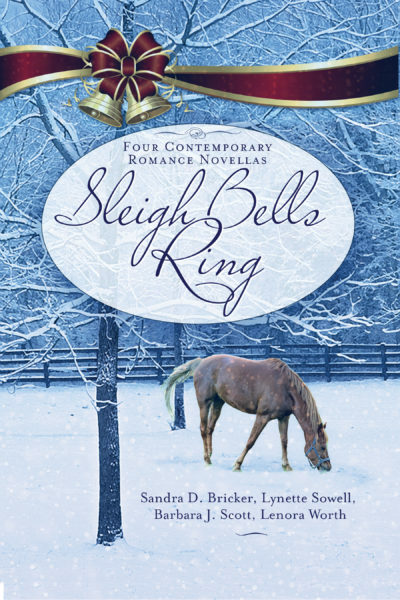 Today I’m showing off the cover for my October release with three wonderful authors, titled Sleigh Bells Ring. It’s a set on a Kentucky horse farm close to the fictional town of Bluegrass Crossing, not too far from Lexington. Joanna, Isabella, Sophia, and Amy Tucker were raised on a Kentucky horse farm by a single mother after a divorce she didn’t want—by a woman who never lost her faith, no matter how bad things got. While Robert J. Tucker, known to all simply as “Tuck,” traveled the world as an officer in the Marine Corps, the five Tucker women never had much . . .but they always had fun making the most of what they did have, especially at Christmastime. It was their mother’s favorite holiday, and she had a way of drawing her girls into the festivities and traditions. Now after their father’s death, the four women return to the farm for one final Christmas, where love awaits them all—along with the memories. The rundown facility which is a home for retired racehorses belongs to them now, but what will they do with it? My character, Isabella Tucker, is a tough cookie after living for years in the corporate world after leaving Bluegrass Crossing behind her. She loves her sisters, but after their mother passed away during Bella’s sophomore year of college, Kentucky was never the same and she hadn’t been back since. Her father’s sporadic role in her life at a young age has caused her to keep people at arm’s length, especially David, her longtime boyfriend—a Kentucky native she met in the gym at her Chicago highrise. David gets her to go home for Christmas one more time to settle her father’s affairs. But he also has other plans she’s not prepared for! Our publisher, Gilead Publishing, will be announcing a fun, fun contest tomorrow, July 15. If you check in tomorrow at my author page on Facebook, I will share the details when that contest begins. Oh yes, I’ve been tuning in to some of the Hallmark movies this month, Lynette. With our temperatures close to 100 and the humidity so oppressive, it’s a refreshing break. I enjoyed the excerpt and look forward to reading all of the stories. The cover is lovely! Definitely keeping cool here, we actually had snow here at home! The mountain nearby (15 mins from home) regularly gets a dusting over winter, but we are only at just over 400 metres above sea level- snow is not regular, so to wake up to snow was exciting for us all. Will send some ‘cool’ thoughts to you all in hot summer weather:) Hard to imagine just last week we were all somewhere warmer for holidays… Thanks for the new book intro, will keep my eyes out for it. The temp today is expected to 97 but will feel even hotter because of the humidity. Being inside with theAC blasting is the plan for the next 2 days😊. Seems like the box set will be an interesting read. Hopefully you can introduce the additional authors so they can give us an excerpt of their novella. Cover looks peaceful and uplifting, which I need this morning. Another hot and humid day. Glad for the comforts of AC, but sad I am spending the summer indoors. Even though humid, we need more rain. Thanks for sharing! Sounds like a great story, Lynette! Thank you for sharing. It sounds like a nice story. I’ll be looking forward to it. I love watching the Hallmark Christmas movies. I watch them over and over. This is very exciting to know about your book. The cover is beautiful! I look forward to reading the story. Congratulations on your new book! I cover is so peaceful–love it. Congrats, Lynette! Beautiful cover and a great cast of authors. Great cast of characters, too, I’m sure! Thanks for sharing this. I’ll watch for it. The authors and stories sound fun and interesting. I have so many Hallmark movies recorded that I having waiting for me to watch. They are getting to be like my TBR pile of books. If I could just clone myself. One to do the writing and one to do everything else. Watching Hallmark right now. Love the Christmas movies. I could watch them all year. Cover looks really peaceful. Stories sound interesting! Such a pretty cover! And four women who find love, that’s awesome, sounds great! I’ve always wondered where phrase “Christmas in July” originated from myself, maybe because it’s hot in most places in the US and people want something cooler to think about? Would be an interesting research project wouldn’t it? I don’t get the Hallmark channel sadly, so I miss out on some wonderful shows and movies. We used to get it, but had to decrease our channel package due to rising costs. And plus, we just don’t watch hardly anything anymore. We’ve been enjoying some DVD sets or movies checked out from our library more. Free entertainment, can’t beat that!